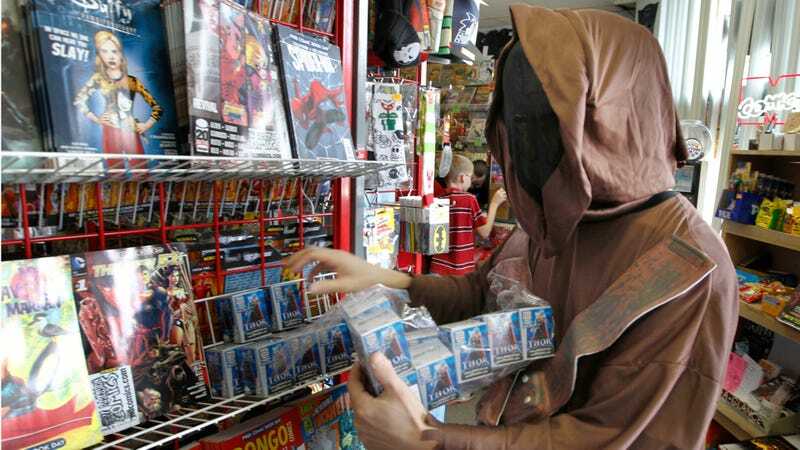 A Jawa cosplayer restocking shelves at the New Dimensions Comics store in Cranberry, Pennsylvania. Though I’ve never met this man, I’m sure he’s very nice. I have a confession to make. Even though I understand the important role that they play in the survival and evolution of the industry, I hate going into real-life, brick-and-mortar comic book shops with a burning passion. Because I didn’t live near any comics stores as a kid, I grew up reading trades checked out from the library before getting into the habit of buying them from the local Borders whenever I could afford it with my allowance. It didn’t really dawn on me until I was in middle school that people actually bought individual issues of comics. Why, I asked myself, would people rather keep up with the X-Men on a biweekly basis when they could just sit down with a stack of trades and follow an entire arc from beginning to end over a weekend? But, being the Pokémon card-obsessed kid that I was, the idea of collecting comics had a certain appeal and so I made a point of begging my mom to take me to the closest comics shop, which as two towns over. After weeks of nagging, plans were set to make a day of venturing off to the Comics Shop Which Shall Not Be Named and I strapped into our car, eager at the promise of getting into a new hobby. Looking back on those moments when I first set foot in the store, I wouldn’t describe my feelings as being particularly positive or negative, but it was definitely... overwhelming. Like many stores, the walls were lined from the ceiling to the floor with gleaming covers that were nothing compared to the intricate labyrinth of long bookcases stuffed with toys and graphic novels that were older than I was. As fun as it was to see mountains of comics piled high as far as the eye could see, it was also intimidating because of how foreign and confusing the store’s organization was. Brand new comics were displayed all over the store, seemingly at random places and there was no real rhyme or reason to tracking down the issues that had come out a week or two before. Why, I asked myself, would people rather keep up with the X-Men on a biweekly basis when they could just sit down with a stack of trades and follow an entire arc from beginning to end over a weekend? The obvious solution to my problems was to just ask someone where everything was, but the response I got from the store clerk—“DC’s there; Marvel’s over there. Is there something you’re looking for?”—wasn’t exactly helpful because, again, all of this was new to me and what I really needed at the time was guidance. I ended up in the manga section surrounded by a bunch of solemn-looking adults as I nervously stared at a shelf full of Great Teacher Onizuka even though I wanted to be nearer to the Cardcaptor Sakura display. Eventually, I wove my way through the packed aisle, grabbed a couple of books without bothering to read the back covers, and beelined my way to the register to make my purchase, feeling more anxious than excited. It would be years before I set foot in a comics shop again and, as I’ve gotten older and incorporated my love of comics into my professional life, I better understand what it was about that first experience that rubbed me the wrong way because my feelings are largely the same. All comics stores are different, but there are certain problems that many shops seem unable to stop repeating. For every person that has fond memories of spending hours poring over comics in their LCS, there are dozens more who don’t have that kind of relationship to those spaces and don’t immediately feel as if they belong. As simple as it sounds, the easiest and most immediate way to address that issue is to simply make things easier to find for newbies who are unfamiliar with a store’s layout. More than that, though, far too few stores make a concerted effort to prominently display a wide selection of series beyond major titles like the Avengers or the Justice League. Even now, whenever I happen to be in a shop browsing, it’s often a Sisyphean effort to dig through all of the flagship books in search of new titles to read. If it isn’t the disorganization, then its the mobs of people standing right up against the racks and shelves who make it nearly impossible to actually see whatever it is that you’re looking for. More often than not, comics shops feel like over-stuffed museum shops full of people who are all lost in their own worlds and unconcerned with making physical space for one another to move through comfortably. These are all the sorts of things that a store’s management should address and yet, in my experience, most don’t—and that’s deeply disheartening when you consider that it’s becoming harder and harder for comics shops to stay open. I would love nothing more than to say that I’d developed a meaningful relationship any of the comics stores I live close to these days, but, unfortunately, that’s just not the case yet. I don’t know that it ever will be.